A few weeks back now, Finn and the rest of the second grade dressed up as senior citizens for the 100th day of school. Here is Granny Scott as she headed to the senior center aka school. 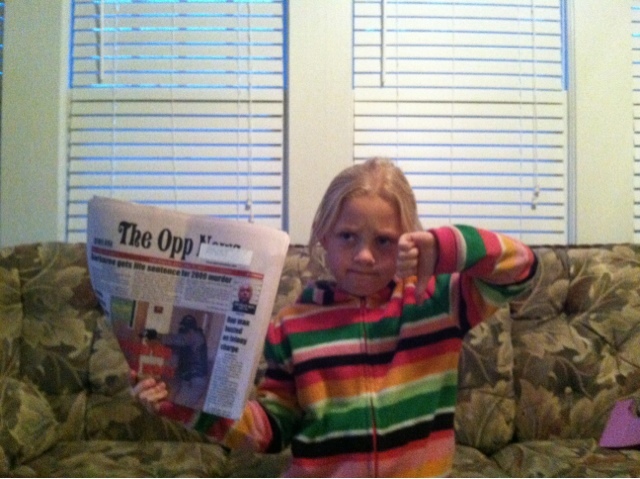 She had a blast and was so excited the next week when pictures of the second grade classes were in the paper. But there was just one small problem that fateful Thursday afternoon when the local newspaper was delivered. The picture of Finn's class didn't make the paper. Another class had 2 pictures and another picture of a small group was also used twice. There were only 5 pictures total. So Finn was mad and upset. While I went to a Girl Scout parent meeting, Finn wrote the following letter to the editor. She also, with TeeTee's superb chauffering skills, hand delivered it to the paper. 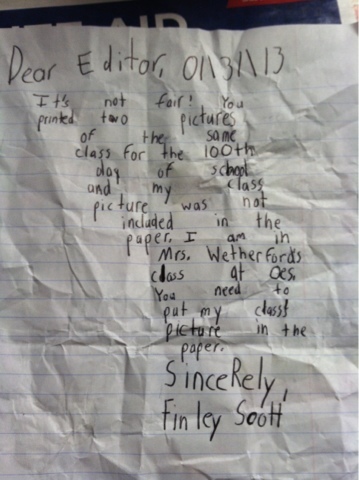 The editor told Finn in a not so nice way that he would not print her letter and that he would look into the picture issue. When I got home and realized all that had went down, I posted this picture to Facebook. The next week I went to the newspaper and requested Finn's letter back (editor kept it for some odd reason) and was able to rescue it from the trash can. I was also talked to in a condescending manner but that's beside the point. I was very proud of my daughter for having the gumption to stick up for herself and her classmates who were not in the paper. The next week, Finn's class and the other missing class were pictured in the paper. Fair is fair and if Finn is watching she will call you on it. Keep it up, baby girl, you gonna change the world!